For other people named John Parr, see John Parr (disambiguation). John Parr (born 18 November 1952) is an English musician, who had two number one hits, best known for his 1985 US number one hit single "St. Elmo's Fire (Man in Motion)" and in 1984 for his US number one rock single "Naughty Naughty." Parr has sold 10 million albums worldwide, and has written and performed 12 Hollywood movie themes, including for Three Men and a Baby, Near Dark, and The Running Man. He was nominated for a Grammy award for "St Elmo's Fire" in 1985. Parr was born in Worksop, England, in 1952. He first entered the music scene when he was 12 years old and formed a band with two fellow schoolmates, which they named The Silence. The band had achieved some success. They eventually became professional and started to tour Europe. He then joined a band named Bitter Sweet who were a huge success in the working men's clubs in Yorkshire, he then formed a " Super Band" with musicians from other working men's club bands, and named the band Ponders End after a Railway Station in North London. Parr secured a publishing deal with Carlin America in 1983, and in the same year Meat Loaf asked him to write some songs for his new album. That led to the fateful meeting with John Wolff, who was tour manager for The Who. Foreseeing the initial demise of The Who, Wolff was looking for a new venture and considered Parr to be a suitable partner. Parr first visited America in 1984 and worked with Meat Loaf on Bad Attitude. Meanwhile, Wolff secured Parr's solo Atlantic recording deal in New York. Naughty Naughty was Parr's first U.S. Top 40 hit record, hitting No. 23 on the Billboard Hot 100 and No. 1 on the Mainstream Rock chart in 1984. 1985 saw Parr on the road with his band "The Business" supporting Toto, his first show with Toto at Carowinds Paladium (Charlotte NC) and playing 10,000-seater venues across America. By the end of the tour, John had a call from one of the world's most successful record producers, David Foster. He requested Parr to record a song for the film "St. Elmo's Fire". Parr and Foster wrote a song in honour of wheelchair athlete and activist Rick Hansen, "St. Elmo's Fire", which also became the theme for the film St. Elmo's Fire (a "Brat Pack" film unrelated to Hansen's life or achievements). The song became a number one hit for Parr around the world and garnered many awards, including a Grammy nomination. Parr went on to tour with Tina Turner on "The Private Dancer" tour and also with Heart and The Beach Boys. In his charity work with The David Foster foundation, Parr has shared the stage and the sports field with stars including John Travolta, Michael J. Fox, Celine Dion, Paul Anka and Rob Lowe. Parr later wrote "Under a Raging Moon" with Julia Downes for Roger Daltrey, a song that paid tribute to Keith Moon and told the story of The Who. The album became Daltrey's biggest solo success in America. Parr's last concert in the U.S. was a duet of the song with Daltrey at Madison Square Garden, joining them on stage were Yoko Ono, Julian Lennon, John Entwistle and Zak Starkey. Parr was soon singing with Marilyn Martin on the song "Through the Night", from the Quicksilver soundtrack (1986). Parr wrote and produced further tracks for Martin's debut album, including the hit "Night Moves". A year after, he wrote and sang the title songs "The Minute I Saw You", from Three Men and a Baby soundtrack, and the power ballad "Restless Heart" (a.k.a. "Running Away with You (Restless Heart)"), from The Running Man soundtrack (this song was re-released on "Man With a Vision" album). After the success of Meat Loaf's album, Parr contributed to the next album with the hit duet "Rock & Roll Mercenaries". From there he began work with Albert Magnoli (director of Purple Rain) on the film American Anthem for which he wrote and performed the main theme "Two Hearts". Parr's other film credits include "Naughty Naughty" from the cult horror film Near Dark and "Love Grammar" from the Karen Black movie Flight of the Spruce Goose. 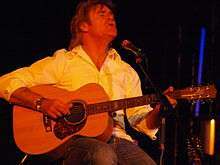 He has also written songs for Tom Jones, The Monkees, Tygers of Pan Tang, Romeo's Daughter and Bucks Fizz. The Pepsi Company and Jack Calmes Satellite TV Corporation wanted to try something new - a gig from London beamed live across America, Japan & Australia on the college Satellite Network. Parr was the featured act, having done two similar shows (one from the Los Angeles Memorial Coliseum where the flame was lit for a special performance of "St. Elmo's Fire", and was beamed live for Japan, and the New Year Christmas Show from London). The show was a great success, reaching almost 50 million people and making broadcast history for the network. That same year Parr was signed by US clothing designer "Chams De Baron" to promote their sports leisure range - features in leading fashion magazines followed and a national poster campaign used Parr's image on America's major city buses for the summer. Later that year, again via satellite, Parr co-presented the UK leg of the "American Music Awards" with Phil Collins. Another dream came true for Parr in 1988 when he was offered the opportunity to collaborate with one of the most successful record producers ever, "Mutt" Lange; (co)producing an album for Romeo's Daughter. In 1989, Parr played the lead role in the soundtrack album for Paris, an epic rock opera written by Jon English and David Mackay. Paris is an epic love story of Paris and Helen of Troy set against the Trojan War. Parr performed with the London Symphony Orchestra alongside Harry Nilsson, Demis Roussos, Francis Rossi and Barry Humphries. The album went on to win many awards around the world. Parr is also known for co-authoring "The Best (A Man Can Get)", the theme used in a series of highly successful Gillette razor commercials from the 1980s onwards, also spawning the company's chief slogan. A solo acoustic version appears on the album "Letter to America". After ten years out of the music business Parr returned in 2006. An unconnected dance remix of "St. Elmo's Fire", entitled "New Horizon" went Top 40 that same year. In 2007, Parr joined Canadian pop-rock artist Bryan Adams on his tour. On 26 March 2007, Parr released "Walking Out of the Darkness", a tribute to Doncaster Rovers F.C. ahead of the club's appearance in the Football League Trophy final at Cardiff's Millennium Stadium on 1 April 2007. In May 2007 Parr returned to Canada to perform at the Man in Motion 20th anniversary. Parr's song "St Elmo's Fire (Man in Motion)" was wheelchair athlete Rick Hansen's anthem, helping him wheel 25,000 miles around the globe and raising awareness and money for spinal research. To date the Rick Hansen foundation has raised $200 million and helped build a research centre, ICORD, in Vancouver. In June 2007 Parr wrote and recorded the main title for Sony Pictures The Brothers Solomon, directed by Bob Odenkirk. On 20 July 2007, Parr and his band opened for Bryan Adams at the Keepmoat Stadium in Parr's home town Doncaster. Twenty years earlier, Parr joined Adams in his home town where they played to 75,000 at the Canadian Exhibition Centre in Vancouver. In June 2008, Parr was a special guest for the U.S. rock band Journey on their UK Tour. In May 2011 Parr performed an acoustic set as Special Guest of Richard Marx on his UK Tour. Parr released a double album titled "Letter to America" on 1 June 2011, and subsequently toured in America. On 11 October 2011, Parr was a guest on ESPN show SportsNation where he sang a special rendition of "St. Elmo's Fire" replacing the words with Denver Broncos quarterback Tim Tebow. A reworking of the song's lyrics, sung by Parr and titled "Tim Tebow's Fire" on YouTube, went viral on YouTube: as of 13 January 2012 it had received 1,000,000 views. The video was uploaded by Denver Fox Network affiliate, KDVR. Throughout 2012 Parr toured America as ambassador for the USO playing concerts and benefits for American servicemen and women. In 2012 Parr wrote and produced a new studio album The Mission. The funds wnet to The USO, USA Cares and Military Families charities. Parr's quest is to raise funds and awareness of military personal's welfare when they return home from active duty as they make the transition back into normal life. In 2014, Parr reunited with The Who, Jeff Beck, Mick Hucknall and other rock musicians for Kenney Jones' Rock & Horsepower concert to raise money and awareness for prostate cancer. Back at his studio "Somewhere in Yorkshire" he joined forces with Guns and Roses producer Mike Clink, who along with Slash and Nikki Sixx, collaborated on the forthcoming Pete Way album. At the O2 Parr joined producer Tony Visconti, Woody Woodmansey (Spiders From Mars), Glen Gregory (Heaven 17) and many members of the original Bowie band to perform in the "Man Who Sold the World" concert. Parr continued his work with the military playing concerts and fund raisers for "Help For Heroes". Christmas 2014 saw the release of "Ring Out The Bells", a charity single produced by David Mackay, which featured Charlie Norman and the children of St Catherine's School along with guest performances by Parr and Meatloaf duetist Lorraine Crosby (I Would Do Anything For Love). The proceeds went to The Great Ormond Street Children's Hospital. 2015 saw John on the road doing international and uk shows with Bonnie Tyler, Kenney Jones, Cockney Rebel..he also wrote and recorded "Man of Steel" for the late International rugby hero Steve Prescott. 2016 The 88th Academy Awards (Oscars) included the launch of Google's Android campaign featuring John and St Elmo's Fire as the theme tune. It's Ironic as the song was tipped as the favourite for the "Best Original Song" Oscar in 1985 but had to be withdrawn as John had told the media that although the song was written for the film he was inspired by Rick Hansen's attempt to circumnavigate the globe in his wheelchair. 31 years later the song is back at the Oscars as the theme song for " Rock Paper Scissors" Androids's new campaign. On 7 June 2016 John Parr will appear as Special Guest of Foreigner on their London Palladium show. 1989 "Paris" (soundtrack album) a rock opera. ↑ Linda Moleski (27 December 1986). John Parr, a man in motion, has new LP. Billboard. p. 34. ISSN 0006-2510. ↑ Terry, Barbara (13 May 2011). "Grammy Nominated Singer-Songwriter John Parr Returns to the USA with his "Letter To America" Tour 2011 and a Double Album by the Same Name". PR Web. 1 2 3 Hunt, Dennis (30 August 1985). "Rocker Parr propelled by hot 'St. Elmo's Fire'". The Bulletin. Retrieved 2 October 2010. ↑ "Actor Ben sparks TV fame with strip scene". Sheffield Star. Johnston Press Digital Publishing. 2 January 2007. Retrieved 2 October 2010. ↑ Roberts, David (2006). British Hit Singles & Albums (19th ed.). London: Guinness World Records Limited. p. 417. ISBN 1-904994-10-5. "Rock 'n' Roll Mercenaries (with Meat Loaf)"
"Blame It on the Radio"